Creating animations can be a fun element to add to a creative writing project. Creating the animation could be the final piece of the project in which students bring their short stories to life. You could also have students create short animations to use as story starters for their written works. Here are five free tools that students can use to create animations. ABCya Animate from ABCya (disclosure, an advertiser here)allows students to create animated GIFs containing up to 100 frames. On ABCya Animate students build their animation creations by drawing, typing, and inserting images. Students can change the background of each frame, include new pictures in each frame, and change the text in each frame of their animations. The feature that I like best about ABCya Animate is that students can see the previous frames of their animations while working on a current frame. This helps students know where to position items in each frame in order to make their animations as smooth as possible. Students do not need to register on ABCya Animate in order to use the tool or to save their animations. When students click "save" on ABCya Animate their creations are downloaded as GIFs. Stop Frame Animator from Culture Street is a neat tool for creating animated stop motion movies. Creating your animated stop motion video is a simple drag and drop process on Stop Frame Animator. To get started creating your stop motion video select a background scene then drag your characters into place. While you have nine background scenes to choose from, the only characters you can use are wooden manikins. You can position the manikins' arms and legs in every scene. After choosing your scene and characters you can add some other props like chairs and beach balls. And if you want you can add sound effects and music to your video by selecting them from the Stop Frame Animator gallery. 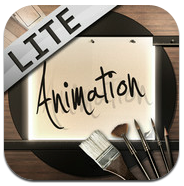 Animation Desk is an iPad app (free and premium versions available) for creating short, animated videos. The app allows you to create drawings using just your finger on your iPad's screen. In the free version of the app (the version that I tried) you can create up to 50 scenes in each of your projects. In each scene you can include as little or as much as you want to draw on the canvas. There are a few different brush and pencil effects that you can use in your drawings. The opacity of the colors you choose can be altered too. When you have completed drawing all of your scenes hit the play button to watch your animation unfold. If you're happy with your animation you can export it to YouTube. Draw Island is a free online tool for creating drawings and simple GIF animations. Draw Island offers you your choice of four canvas sizes on which you can draw. Draw Island offers two canvas sizes for creating simple GIF animations. To use Draw Island just head to the site and select a drawing tool. You can draw free hand (or should I say free mouse?) or select pre-defined shapes to use in your images. When you're done drawing just click the save button to download your drawing or animation. Wideo is a service that allows anyone to create animated videos and Common Craft-style videos online. You can create an animated video on Wideo by dragging and dropping elements into place in the Wideo editor then setting the sequence of animations. Each element can be re-used as many times as you like and the timing of the animation of each image can individually adjusted. Wideo's stock elements include text, cartoons, and drawings. You can also upload your own images to use in your videos.